THE PERENNIALS AND HARDY ANNUALS I planted in milk-jug greenhouses last winter have finally sprouted — and how! Probably I could furnish my entire neighborhood — if not my whole county — with lettuce, spinach, Bachelor Buttons, and more. Did you winter-sow, too? 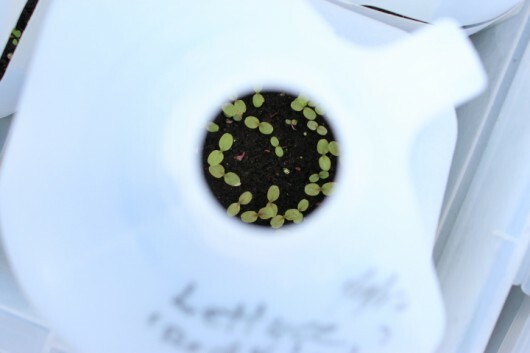 Let me know how this outdoor method of seed-germination is (thus far) working out for you. Now back to you. In the comments field below, talk to me about your winter-sowing successes (or failures). As always, I love to hear from you. Ahhh Spring! Thanks for the report. I have no sprouts yet, but I usually am a week behind you so I have faith. I use your watering method and just did that as all the milk jugs looked pretty dry. Unfortunately I also had a full watering can sitting out for my containers of pansies. My neighbor’s 2 y/o decided to help me out and watered through the spout of the milk jugs. Ugh! Luckily she only got to 2 before her 4 y/o sister and my 6 y/o sensed it was not so helpful and came to alert me. Kids are lucky they are cute! Now that my boys are a bit older I forgot what a garden hazard a toddler can be. Wondering about your garden beds as I know you just pile on the shredded leaves. I did that this year but they are not completely broken down. Do you mix them in or just leave them and move a bit aside and plant? Hi badger – I push the shredded leaves in between rows at planting time. When the seedlings are tall enough to warrant mulch, the leaves are right there, ready to be spread around the plants. Mine are finally up. I sowed in Feb as usual, but this year our southern Indiana winter was brutal and the seeds were smart enough to stay put for an extra couple of weeks. I’ve got peppers, tomatoes, lettuce, onions, leeks and eggplant showing up now. Finally. I live in Zone 5b, Kansas, and things get very very dry here and windy, so I have had to bottom-water quite a bit because my jugs dried out easily. 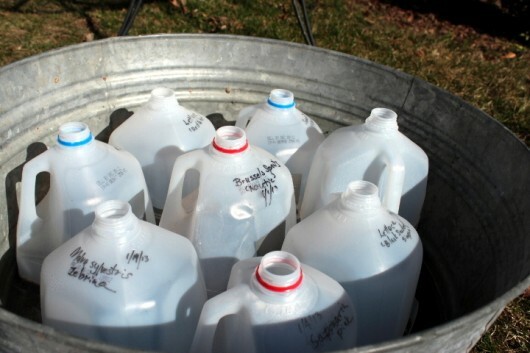 I found that a good-sized clear storage bin will fit 6 jugs at a time perfectly, so I am often out there checking jugs and watering them if they need it. Nothing has sprouted yet. :>( My containers were covered with snow just about all Winter long. Actually, we had a BIG meltdown about 2 weeks ago. So everything is now completely “snowfree”. I don’t usually start seeds inside, but I was so stir crazy from being cooped up this winter I started nicotiana and sweet peas indoors. They’re doing great! They should be ready to plant out about mid-May. I just have to remember to start to harden them off about a week or so before that. Only lettuce has sprouted here in w. NY. I got a late start and didn’t sow until first part of March. Then we got bombarded with deep snow and now lots of rain. My milk jugs were more mud than soil a couple days ago. So the past few days with temps in 50s and 60s, I’ve opened them up to dry out a bit. Waiting to see if anything else develops. I have high hopes. My kale, broccoli, cabbage, red lettuce, sunflowers, onions, and a few tomatoes! have sprouted. Still waiting on most of the other hot weather veggies. I am in NC. What did NOT sprout this year was celery. It is my first year trying celery and they are brand new seeds…anyone have any idea what happened? They are a cool weather crop so I would have thought they would have sprouted by now, for sure. They were planted in January…do you think that was too early? With this awful winter, alot of the perennials look bad. One of the worst is the lavender. Can I cut that back now, or should I wait til after it blooms? It’s an old plant, but I’d like to try to salvage it anyway. What do you think? That’s encouraging- only my bachelor buttons and lupin have sprouted as well. I’m keeping my fingers crossed for the (27!) other jugs. I live in zone 5 Vermont. Nothing yet here in Western Iowa. I am hoping at see some green this week! I have lots of sprouts growing. Marigolds, Cosmos and Zinnias. We don’t start the seeds as early here in Oregon. I have been showing the process to my friends who work with childrens’ garden plots at the schools. And we don’t have to worry about the jugs getting enough water here in Oregon! Still too early to plant in the ground. Hi Kevin, love your blog! I am wondering, is it too late to “winter” sow some jugs now that it’s spring? I am in zone 6. I planted a few jugs in March (tomatoes and peppers), but want to do more. I am new to winter sowing. Thanks! The snow has almost melted and I now can see most flower beds. The magnolias, spring bulbs, primulas and pulmonarias will soon burst into bloom! I can’t say that for my winter sowing, still no sign of life yet. I have faith that the little dears will appear soon. Have had so much fun with this, Kevin – thanks for teaching me about winter-sowing! I am growing hydrangeas and roses as well as native perennials (so easy and perfect for our bees and birds)…sometimes I get carried away – my mountain mint babies will have to be cut up like brownies there are so many! Set out my tomato seed late so nothing yet. But then they are calling for snow again this week – amazing! Thank you for the winter sowing method. I shared it with my garden club membership. I direct sowed spinach in january and left it outside. I will transplant when theyare a little bigger but they have been up for a month. I also sowed some kale and peas in little peat pots and put the pots in the milk jugs outside. Left them for about 3 weeks- so much stronger. And I just left the lids ajar. i didn’t have time to open and shut I forget! Thanks for the great idea! I live about 100 miles east of Vancouver BC. Much milder weather! kevin, you’ve been such an inspiration and i’ve gone just a tad overboard and have LOTS and LOTS of jug-filled seedlings (to beat the law of averages here in new mexico where some years my perennials in my garden just give up the ghost and i’m constantly infilling). here in new mexico i’ve had to water. in fact in a few jugs i’m growing MOSS! we never see moss in these parts. did i overwater or is the drainage now working in those jugs? the seeds did not sprout in those jugs and i’m wondering if i should scratch the surface and break up the moss. thanks, as always. Last year was the first time I had ever tried winter sowing and it worked great. We had a pretty harsh winter this year and, well, my winter sowing has not been as successful. So, I planted again. The brussels Sprouts are growing as well as a mystery jug as the writing washed off. I didn’t know sharpie would wash off, but I’m learning. If my peas take, I will have multitudes and I am hoping my tomatoes grow. Thank you for this blog, Kevin, it has really helped this novice of gardening! My kale and flowering tobacco have sprouted. In an earlier post I said that thanks to an invasion of roudy racoons, my winter seed sew ing project was dumped on the deck. mumble, mumble, munble blasted critters!! I am trying again with annuals just to prove to myself that your idea really works in this corner of the universe. A repeat of the question posed by Debra in comment #9 about lavander. I have a very old plant that was transplanted hurredly to avoid being crushed from construction activity. It was struggling where it was but has thrived in its new location and is more than double in size to the point that it’s shaggy and unkempt in appearance. Should I just accept this or can the plant be pruned back, if so when and how severely? None of my garden books address this question so why not sit at the master’s knee? Your instructions for increasing African violet plants has been overwhelmingly successful. I started with 2 plants and have the potential for literally dozens. Each leaf has produced at least 2 sprouts and I’m running out of space to put them. OH what a glorious problem to deal with. Thanks, Kevin. Love this site and everything you and it represents. About 20 jugs sprouted, including lupin, a perennial mix, and a bunch of mystery jugs. I bought lab markers last fall to keep the ink from wearing off the jugs, had tried sharpie last year, and still have about 50 mysteries!:). But that’s fun too. Kevin, do you use a particular kind of Sharpie marker? This year I bought a flat under-bed storage tote to set the milk jug planted totes into for bottom watering. My smaller totes hold 6 milk jugs each (Of course I didn’t put holes in this new one) it works great to just lift the smaller totes with the milk jugs into the larger one when they get dry. Last year I used the ‘moisture control’ potting mix and found that some seeds were a little too damp, so this year I used the regular potting mix and I’ve had to bottom water twice. We’ve had a really dry cold long winter, (I planted 24 milk jugs this year) Baby plants are starting to pop-up like crazy in my milk jugs! Yay!! The bunnies are grazing on my tulips something awful …any suggestions? By the way I just love your blog! Hi Kevin, Spring has finally sprung in my corner of BC, Canada, (zone3) although we have been getting -2 at night.. Into the low teens in the day and this week looks like all above freezing at nighty, Yahooo! My winter sown seeds are doing great. I have mustard, kohlrabi, red and white swiss chard, italian broccoli (raab), romaine lettuce, calendula, and indian blanket sun flowers up!!!! This morning I had to redo all my felt marker labeling as it had faded quit a lot, not to much trouble and gave me a chance to examine each jug. Thank you so much for your wonderful blog and all you inspiration, Winter Sowing is the way to go!!!!! One Grateful Gardener! I planted 6 jugs with seeds for my first time winter sowing. I was surprised to see that some of them have already sprouted, since I live North of Duluth in Minnesota. Unfortunately, I can’t tell what has sprouted, since the permanent marker that I used to label my jugs has washed off all the labels except the jug planted with delphiniums. 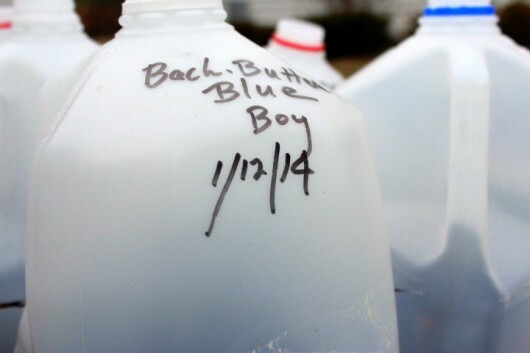 Next year, I’ll plan a fail safe way of marking the jugs. I will definitely do this again next year, with more jugs. I tried this method for the first time. I sowed five jugs with a variety of herbs, flowers and lettuce. I have lots of lettuce seedlings, some swiss chard, a few marigold, oregano and other herbs coming up. The only thing that hasn’t shown a green leaf yet is the jug of hosta seed- but my seed might not be viable… I’m very pleased with my modest success so far. It’s much easier than tending seedling trays in windowsills and under lamps! Well, I was a little nervous at first but decide to jump in and made over twenty planter boxes. Everything has sprouted except my Watermelon seeds but that’s okay I’ll give them more time. One of the flowers we planted along with the Blackeyed Susan only had one or two little sprouts so we will leave them be for a little while longer. Our next adventure is to till and set up the garden fence and gate to keep out the critters so we will have a nice place to put all our stuff we planted. Love the milk jugs, we tried from seed last year with direct sowing and package directions and it was a disaster. Thanks so much for all the info. Here in the B.CRockies we are still getting frosts. As to pruning lavender, if the winter doesn’t do it, I still cut them back to about 6″ as they have self sowed in the rock stairway. My jugs have not sprouted yet . I planted cleome in them and a few perennials that need stratify ing. It seems to be the only way I can get cleome to germinate. However I shared the milk jug method with the garden clubs and have reports back of lettuce,spinach etc taking off in them already. I have a 20′ long lean-to greenhouse and 15 ft of cold frame so the jug planting is an extra.. And less work. I didn’t get as much planted as I had wanted but I do have spinach, peas, beets, carrots and some flowers up and looking very healthy. We are expecting some more cold weather this week with heavy frost and freezing so we’ll see how things go . We live in Missouri in the St. Louis area so we are much colder than normal this year. Today the tomatoes sprouted a tiny shoot. There’s no progress yet on the rosemary, parsley, or jalapeño. Tomorrow night they’re calling for possible snow and temps in the 20s, so I plan to cover the milk jugs (that are on a picnic table) with some old tablecloths. This is the first time I sow Delphinumseeds and they are sprouting.Pansies, petunias , lettuce , cockscomb ,cardinal flower are sprouting. I also sowed basil but have not seen any growth yet.This is my third year winter sowing and I am getting better ever year. Thank you for all the advise. Even though I wrote the names on the milk jugs with a sharpie, some how the names faded, disappeared, were erased by garden gnomes. All but one jug has sprouts and I transplanted my lupines into larger pots today. I think 2 of my other jugs are kale, I do not know what the last 4 are, they will be a surprise! I am sold on winter transplanting, and will plant a lot more next year with a better naming system. I have 14 jugs and only one has visible seedlings so far – burgundy Bachelor’s Buttons. I think they are all waiting for warmer temps. We have a freakish 81 degrees today!! I winter-sowed broccoli, brussels sprouts, peas, spinach, summer squash, beets. Of those I have one broccoli or brussels sprouts seedling, 5 spinach seedlings, and about 5 summer sqash seedlings so far. I’m disappointed the peas haven’t sprouted yet. It’s starting to warm up here in zone 5 eastern Massachusetts. I planted red norland potatoes and softneck garlic in a raised bed today 🙂 Kinda late for garlic, but we’ll see. Thanks for your blog and all your great recipes and gardening ideas! I tried winter sowing of 6 varieties of heirloom tomatoes this year to see how this would work in NC. We semi successful as I planted them late in Feb. All varieties sprouted some in each jug. We put up a greenhouse and started all of our seeds out there. I transplanted all our tomatoes into larger pots and they are doing really well. I will do winter sowing next January and will do many kinds of seeds; because, it is a much easier and less expensive way to sow. This year after reading Lauren Springer’s method in the book Passionate Gardening, I decided to try sowing seeds in plain quart and gallon containers left over from nursery plants (open on top). It seems this is how they have been doing it in the UK for many years. 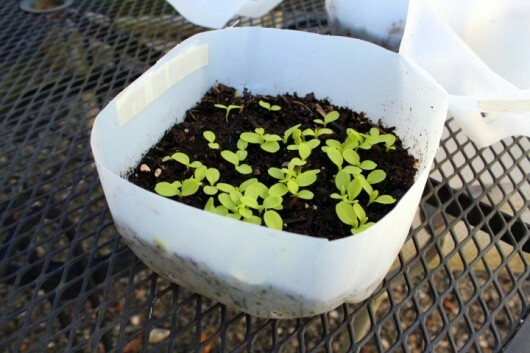 Both milk jugs and open containers are germinating well, but the milk jugs need less attention, because the planting medium stays moist longer. Can’t wait for my first round of winter sown perrenials (last year) to strut their stuff! I peeked in to my jugs today and have some herbs started, carrots and Bachelor Buttons sprouted. It is so cool to see. Here in Zone 4 only my lettuce has just started to peek out. Cold and rainy here now. This is my first year. I usually don’t plant anything until the first of June! I am excited. Thanks for the ideas. My radish seeds sprouted a few days ago. I have about 20 milk jug greenhouses. With the temperature in the Hudson River Valley hitting 79 today, I expect that seeds will soon be popping out all over. Hi CarolB – I wait until lupine achieves a fairly good size (check out “Winter-Sowing 101” link above to see pix) before transplanting. Where I live, the plants often bloom a little their first year (but not until late August). The big show occurs the second year, when oodles of tall, stately flowering spikes emerge in mid-May. Newbie Success! Zone 4B already has lettuces, spinach and arugula sprouting. I’m so happy to be getting away from grow lights which need a lot of babysitting. If we can succeed with a winter like we’ve just had, then imagine the possibilities. Thank you so much Kevin for introducing us to a great method. Our passion just got a whole lot more fun! Newbie Success! Zone 4B already has lettuces, spinach, radish and arugula sprouting. I’m so happy to be getting away from grow lights which need a lot of babysitting. If we can succeed with a winter like we’ve just had, then imagine the possibilities. Thank you so much Kevin for introducing us to a great method. Our passion just got a whole lot more fun! My jugs placed in full sunlight sprouted too late! I’m zone 6B and my direct sown seed is ahead of the jugs by far. Even volunteer tomato plants in the garden are ahead of the jugs. With the hot summer ahead I was afraid to wait for the milk jug plants to catch up. My last frost date is April 15 and my garden has been most successful if I plant a week or two before that date. Any suggestions? Better success with flower seeds vs vegetables? Not sure I understand the reasoning behind cool season veggies started in jugs? Using your advice I winter-sowed 16 jugs. The first 8 are sprouting!!! But the writing bleached off the containers, even though I used a sharpie. Go figure. The second set of jugs have a number (like a dice face) melted into the top which I then also wrote the empty seed packet. Wish me luck figuring out the first 8! So far I have alyssum, bachelor buttons, portulaca, yellow marigold and cosmos sprouting. Still waiting on the zinnias. And I’ll get out some tomato seeds this week. Greetings from Lexington NC.This is a great idea-first time trying. I have some nice tomato seedlings 2″s. Will be preferred method now!!! Only one jug (pansies) have no sprouts. Have enjoyed a few 60 degree days lately, but expecting snow flurries tonight and low 20’s temps, so brought tender young-uns into unheated garage for the night. Have been bottom watering the last few days. Fun and exciting experiment so far! I have loved every day of my first winter sowing experience! It allows you time to dream your next garden beds, work at a pace that suits your life, and extends the pleasure of seeing what you have sown much sooner than the normal gardening season. I put out thirty different milk jugs from January to March, and most (except tender annuals) have sprouted. I read, after putting my jugs out, that using pencil to label your mini greenhouses works. So, I switched to store-bought plastic plant markers and used 2B pencil before the Sharpie completely faded. The little plastic plant markers had a hole punched in one end, so I used gardening wire to twist each onto the the milk jug handle for easy identification. I had also used some old sticker alphabet letters with clear tape over them to begin with – they held up better than the Sharpies too. Dill is up, parsley and catnip (for the local animal rescue) are up as well. Tomatoes and peppers are inside the house in a very sunny window–seem to be okay so far-will put them outside in the sun each warm day to give them more direct sunlight till transplanting time. I’m using a China marker (kind of a wax pencil photographers used to use in the darkroom) this year as I discovered Sharpies fade and my pencil labelled markers didn’t work so well either. Hoping the China marker survives so I know what is what! My seeds all sprouted and the seedlings are growing nicely. I am in SC so we transplanted everything about a week ago because we went to the FL Keys all last week and I wanted to make sure everything was watered. We came back last night and the plants look great. We have tomatoes: Cherokee Purple, Peacevine Cherry, Stupice, Tomato Carbon, Sunset’s Red Horizon, Roma, Brandywine, plus Zucchini, Oregano, Parsley, Basil, Chives, Garlic Chives, Armenian Cucumber, Clemson Spineless Okra. Flowers are Bachelor’s Buttons, Cosmos Rose BonBon, and a few more. I hope everything keeps on growing. Thanks for the tips. I love your newsletters and humor. This is my first year doing this, but I am sure I will be doing this from now on. I live in zone 7b (Raleigh, NC) and sowed my seeds in February after collecting milk jugs from my son and daughter-in-law. Everything sprouted! Some better than others. But it is time to plant them now. I tried squash, carrots, lobelia (so tiny), poppies, morning glories (only a few germinated, but that’s better than I have done in the past), cleome, lobelia, and seeds I gathered from a neighbor’s plant, yellow hibiscus. Very excited about this one. Now that I know how to do it, next year will be even more abundant! Thanks so much, I love “A Garden for the House”. I’m in Georgia visiting my sister right now (she’s another fan of your blog), but when I head back to WNY later this week, the first thing I will do is check my mini green houses and see how they are doing! I have told everyone about them and I bet my town will be covered with them next year!!! I live in Iceland and I tried wintersowing last week – some kale and other hardy annuals. Can you please do a post on how you transplant your beetroots, I can’t seem to get the hang of it. I love your blog, please continue being awsome! About two thirds of my “greenhouses” have sprouted. Still nothing here in Philadelphia from the spinach, beans, peas, or tomatoes. Keeping fingers crossed. I’ve got 20+ containers coming along. So far, only Dame’s Rocket (Hesperis matronalis alba) and Korean Hybrid chrysanthemums are up, but lots of each, and the other containers look happy and smug. Wait, news flash! Cyclamen coup is up, dozens of ’em. I am doing almost all of my vegetable garden this way and having great success in my second year of trying this! Tomatoes (enough to feed the whole neighborhood), jalapeños, thyme, rosemary, melons, basil, peppers, and some morning glories all are going strong. We had one night of a sleet and colder temperatures that claimed some cucumbers. I also don’t think I planted my Black-eyed Susan vines and moon flowers early enough. My oregano has not come up yet and am wondering if it is because they are last year’s seeds. I’m not sure if the germination rate holds for them. Maybe a good blog idea on how long seeds last??? My direct sown raised bed is doing nicely with radishes, carrots, lettuce and peas. So glad I found this blog! have grown out of the top of the milk carton tops.did exactly as you said,they are so healthy,but of course i am in England and our temperature is very changeable here,do i put them straight into the ground, or pot them up? i have STOCKS, ASTERS,AFRICAN MARIGOLDS,TALL RED CORN FLOWERS, BLUE CORN FLOWERS,NEMESIA The temperature to- day is59f,so what do you think i should do?Kevin.many thanks Yvonne Moram. Hi Yvonne – So glad this method worked out for you. You can plant the seedlings into the garden now. Update…. most everything sprouted but hardly grew beyond the true leaf stage. I transplanted the tiny seedlings into the ground today. Not sure why growth was so hampered, they had full sun. The alyssum that I started late did the best. Still tiny but the best germination. Kevin, I was so excited about this method and for the most part it worked out great! I had tons of cabbage, lettuce, broccoli, and several herbs. I did have squash sprout. My zucchini didn’t sprout at all but I had one single spaghetti squash sprout and it gave me two squash! I saved my jugs and luckily had a local group on a mission trip save me their jugs,so far I have over 60 empty jugs. So I will be very busy planting this winter. Kevin – this is my first year winter sowing. I have iceberg lettuce sprouted! I can’t wait to see what comes up next. I have carrots and banana peppers from seeds I bought at a store. But I planted spaghetti squash, acorn and butternut squash from seeds that I scooped out of the squash. How do you think those will do? I enjoy your posts and have forwarded the winter sowing information to several people. sprouting are tomatoes, cilantro, spinach. I notice there is a moldy green carpet on the surface in some jugs. What gives and how often should I do the watering bath?